The cast and crew of Black Panther attending The Black Panther European Premiere at The Eventim Apollo Hammersmith London on Feb 8, 2018. "Black Panther" is the first film with an African-American director and predominately black cast in history to break box office records. This past opening weekend alone grossed a staggering $235 million in North America. 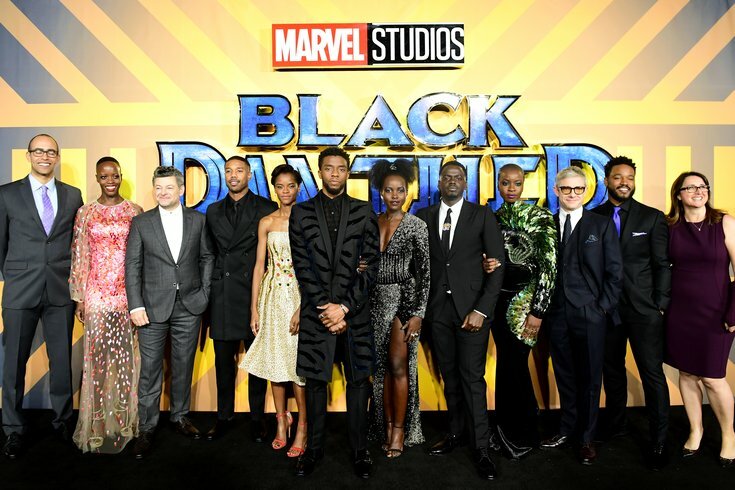 The film, which is inspired by the Marvel Comic of the same name, has been sparking discussions about what its success could ultimately mean for Hollywood projects down the road, namely, whether audiences will see more vehicles inspired and created by African-American artists. Dr. Sheena C. Howard, author of The Encyclopedia of Black Comics, has been studying the impact of race, gender and sexuality in the comic book world for many years. Born and raised in Philly, Howard is an associate professor at Rider University’s Department of Communication and Journalism, where she’s developing a new concentration in comics. In 2016, she wrote, directed and produced the film “Remixing Colorblind,” which took a look at how higher education shapes our perceptions of race. As more audiences flock to theaters to see "Black Panther" for the first (or second and even third time) this week, Howard talks to PhillyVoice exclusively about what makes the film so timely, as well as some surprising anecdotes about the story’s relationship to the Civil Rights Movement. PV: Why has Black Panther become such an important touchstone in Hollywood right now? SH: Black people have buying power and black people are excited about "Black Panther," but white people are too. Within the political moment and time, our President is a documented racist evidenced by his own words and actions, thus, "Black Panther" acts as a temporary moment in time of escapism – but it also asks us to think about racist American history through an afrofuturist lens where black people have power. SH: It takes us outside of reality, into a realm where black people have agency and black women have a voice. During times of political strife and difficulty, comics have always functioned as a form of escapism. Also, Hollywood is about bankable moments. There were several indicators that "Black Panther" would be a financially sound investment, from the success of "Wonder Woman" to the excitement of the "Black Panther" cameos in previous films. Also, the writing of "Black Panther" by Ta-nehisi Coates sparked new interest for some and engaged a new segment of the population. Hollywood noticed. PV: What do you think the gross from opening weekend says about not only the film but also the huge audience support for films featuring strong black characters? SH: The audience has spoken loud and clear time and time again – they want diverse superheroes in the comic books and on screen. The support also has to do with the importance of representation and people of color seeing themselves from a position of privilege, power and in control of their own destiny. We very rarely get this in film. "Black Panther" was able to provide that sense of imagination because T'Challa (the main character) is from an African nation that has never been colonized and is technological advanced. PV: There's actually a lot being written about why this story is important in terms of race. What does the film ultimately tell us about race and gender? SH: This film is getting so much attention because it is the culmination of significant historical events in film, media and comics. Over the last five years, at least, there has been a Black Arts Movement, in which niche interests and underground genres have been exploding into mainstream consciousness. There has been a Black Nerds Renaissance, if you will, criss-crossing mainstream media and interacting with movers and shakers across different industries. You can see this thru New York Comic Con panels, in new films and series such as Luke Cage and Black Lightening, but also in the emergence of the serious study of comics in academia. You can see it with the writing of "Black Panther" by Ta-Nehisi Coates and then the spin-off by Roxanne Gay, people previously not in comics, but superstars in their respective fields, engaging with comics, particularly black comics. PV: What does the film have to say about what it means to be black in America today? SH: The film clearly urges the audience to think about moral questions around nationalism (whether white or black nationalism), as well as the trauma of being oppressed in America. Killmonger (a fictional super-villain) was the product of a racist American society and all that comes with it as a black person in America, like toxic black masculinity, sexism, misogyny, violence and the yearning for power. Wakanda (a fictional East African nation) was purposive in isolating itself from the outside world, but in reality, black Americans were purposively isolated in America – from slavery, to segregated schools, to Jim Crow to redlining, to de facto segregation to racism across every facet of a black person’s life. Some people would argue that the black family and black ideals were stronger during segregation, yet the isolationism that T'Challa wanted is not much different than the isolation that President Donald Trump supports: Building walls, removing immigrants, etc. One thing the movie made clear to me is that even when race is not a factor, power still keeps people divided and in disequilibrium. PV: What kind of line can we draw between the Civil Rights Movement and "Black Panther?" SH: "Black Panther," the comic book character, was featured the same year as Black Panther, the party. But the character was not based off of the Black Panther party. Actually, they changed the name of Black Panther to Black Leopard because they wanted to disassociate with the Black Panther party. However, the racial politics of the time certainly did give way to the creation of "Black Panther." During the 60's, black people were fighting for equality, visibility and rights, the creators did not live in a bubble and the political climate certainly speaks to the existence of a black character. Its interesting that the character was created as an African and not a Black American, making the character “exotic” and allowing for a distancing from the racist archetypes of Black Americans in media. PV: There was certainly a lot of pressure for this film to be great. Did it succeed? SH: There will be analyses of the film for days and days, and there are parts of the film that need to be deconstructed and discussed. For example, the black American is still demonized in the film and the film still felt a need to incorporate a white guy who had a hand in saving Wakanda's vibranium from being exposed to the rest of the world. Yet, I feel even those dynamics are less problematic because those images and scripts are a part of a film that shows the multi-dimensions of black people. It does not portray single dimensional iconography of black people. Instead, black people are complex just like every other group. Black people are messy. They are royal. They have family disputes. They also have happy families – it’s all depicted here. PV: How loyal is the film to the comic? SH: The film did a good job of explaining who and where T'Challa came from and establishing sacred rituals of the Wakandan people. The film also made a problematic character such as Man Ape (known as M'Baku), leader of the Jabari tribe, into a more complex and principled character instead of a caricature. Obviously, a character created in the 60's who is a super-villain named Man Ape is racially insensitive and inappropriate. I think the director took the elements established in Chris Priests’ 90's version of "Black Panther" and made M'Baku into a far more integral character that moved the plot and storyline forward, showing the different facets and identities that make up Wakanda. PV: What really stands out to you in the film? SH: The depth of the relationships stood out to me. The dichotomy between Killmonger and T'Challa stood out to me. There is so much to unpack there. In the name of isolationism and to save face, T'Chaka killed his brother and left his nephew with seemingly no remorse. What Killmonger became and his ideology speaks to the ways in which an oppressive society creates internalized oppression and problematic power dynamics. The relationship between the brother and sister is a special treat; I don't think we see brother-sister relationships in that way in film often enough. PV: What about the portrayal of black women? SH: The relationship between Nakia and T'Challa was very well done. Nakia was strong-willed and independent, and she was not penalized for it in the film. Many times when we see black women in film who are successful and independent, they’re often depicted as not being able to have healthy, intimate relationships. Women are nicely portrayed in the film – I would like to see more of that going forward. PV: Okay, so being an official comic book expert, what other black comics would you like to see get the Hollywood treatment? SH: I would like to see Ayo and Aneka have a more prominent lesbian relationship in future "Black Panther" movies, or have their own movie-spinoff. These are two female warriors in Wakanda who have a lesbian relationship in Coates’ "Black Panther" series. This aspect was not depicted in the "Black Panther" film. I would also like to see Storm have her own movie. And I would really like to see 17-year-old Destiny Ajaye from the comic book Genius: Cartel have her own movie; I think that would be awesome! She takes on the LAPD in South Central Los Angeles and it’s a wonderful storyline. These are all superhero archetypes that we have not seen on screen. I’d also like to see any Octavia Butler book get the Hollywood treatment – we are long overdue for this.